I'm getting ready to paint some of my furniture red red red!!! Could that be the next incarnation of your SIL's sideboard? LOVE the color! What is it??? Wow, it looks great! This is a beautiful color:) I like it!!! I think it is a wonderful colour and you've dressed it up nicely. I like it how it is, and I love the chest underneath! I love it. What color did you use? Well I LOOOOOOOOOOOOOOVE the color...a icy sort of robin's egg blue perhaps? Great piece. It looks great....what color are you thinking...robin's egg blue, red, black??? I'm curious! The color looks great unless it doesn't coordinate well with the rest of the room, leave it and it will find its way into your heart. i like it that color. but i also think it needs to pop a little more. what color do you REALLY want??? and i can't wait for that skirt tutorial. I LOVE it and all the things on top of it...so pretty!!! REALLY? I totally LOVE this color. And I'm talking L.O.V.E. Not just like a crush kind of love. This color reminds me of robin's eggs and beaches and summer. LOVE IT! I think its fabulous, but if you're not happy with it, then change it!! I like the blue, but it would look really good red! I mean really good! Congratulations on the sprouts--now just keep watering, it's that easy! I think it looks better, but it could look really neat in a different color too. 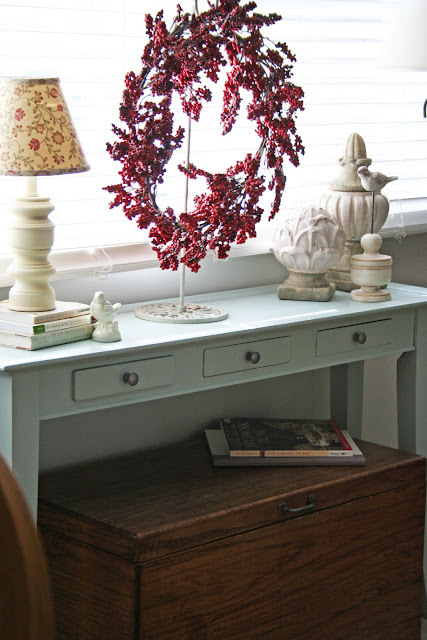 I am scared to paint my furniture in colors other than black or white...need to get over it! ;) I love the way you arranged everything! The table looks great...is it a robin's egg blue color...hard to tell from the photo. Wondering what other color you're thinking about!!! I love it just as is in this soft pale color.. Don't change a thing. I think it looks great but I totally know the feeling at the beginning when you're not sure if you love it or not...I have a table very similar to that...maybe I should paint it :-)Thanks for the inspiration! i LOVE that color!! it looks so clean and fresh! very nice table!! I love the color and the cute little drawers! What's wrong with that color - I think it looks great! I also know that it's important to love the things that surround you. Maybe it will grow on you? You're a wizard with paint! I love the color, but I'm a robins egg blue, sea green kind of girl. P.s. I told you in the past I'm not a big red fan to decorate my house, but recently I've found myself gravitating toward it. It must be the red Moda polka dots! I like it! I like the wreath too. I love the outcome! It looks like this picture came from a magazine! I love the color! And it looks beautiful! oh my! I totally love the color. Looks beautiful and love all of the fun things on top too. Love, Love, Love it! Did I tell you I Love it?? That is such s great little table. Super job! It looks great! I have a table that needs some paint. It's actually ready, I just haven't taken the time to do it yet. You've motivated me. i LOVE the table!!! i think it's the perfect color. oh, and thanks to you, my kids and i had fun finding creepy faces in our honey buzzers at breakfast this morning. fun times!!! Oh I have to say I LOVE the color. 'specially with the red berries. LOVE it!! Paladian blue...do you have any idea what brand? I want to paint a grandfather clock and would love that color. Oh you are such a dork, it looks AWESOME! You have been busy!! We have company this weekend, but I'll call you next week for sure. talk to you soon! It is so pretty all the little touches are beautiful where did you get the wreath and the stand for it? Can't quite tell if it is more white or more blue? I have some new aqua/duck egg blue accessories for my kitchen (on my blog today) and wonder is it the same shade? If so I love it! If not, then I suggest you paint it so that it is!!! Wow I think this looks fabulous! If you are not sure about the color you might try a glaze over this- it could give it just the look you might be wanting! I'm pretty sure I'm LOVING it.